We left Shanghai, a vibrant, twitchy city sporting both imperial architecture from the early 20th century and provocative new skyscrapers from the 21st, with the iconic Pearl Tower as an unmistakable exclamation point. At 23 million, it’s China’s largest city, with 6,000 people per square kilometer (New York has only 1,800 but Singapore is twice as dense at 11,100). When we arrived in Beijing on the bullet train, we saw a slightly dowdy city (only 17 million, 5,000 per km/sq), a little run down, maybe even a little down on its luck. Not as clean as Singapore, not as stylish as Shanghai, not as noisy as New York. And under grey skies. Maybe it was just the weather system – probably not – but the sky was grey and low all the way from Shanghai to Beijing. It wasn’t yellow like Los Angeles, but it didn’t smell good or feel good in the throat, either. 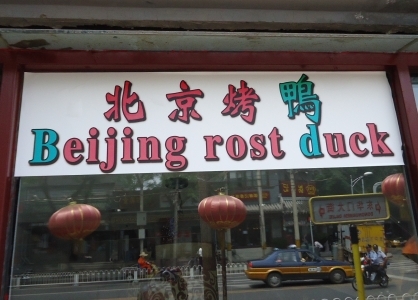 After we arrived and unpacked, we met Sam, our new Beijing guide, for a trip to the roasted duck restaurant for Peking duck in Peking. As we passed to our table, we saw a chef using a long stick to hang dozens of raw prepared ducks in a big oven with a big fire. When they came out, they shone a beautiful deep golden brown. The first challenge of ordering a Chinese dinner is deciding on the dishes. Meats, cold dishes, hot dishes, dim sum, soup, variety, contrast, quantity, likes, dislikes, things to reject on principle (no snake, no intestines) all have to be considered. And the menu is typically a book that has to be browsed front to back and again to understand the range of choices. What we invariably discover is that no matter what group, a group decision is just impossible. Someone has to play the host, order for the group, and hope that it all works out. In this case, even though we were only three (Nancy, Sam the Guide, and me), the rule held. Sam played host, but only until the check came, when it became my turn. Dinner was: a duck, of course; a cold dish – needle mushrooms; two hot dishes – Chinese broccoli with tree fungus, and pumpkin with lily; rice – the one invariant for a Chinese dinner; and a bottle of Great Wall cabernet sauvignon, which, contrary to all reasonable expectations, worked out just fine. Good, but Nancy and I agreed that we’d had better Peking duck years ago in Atlanta. 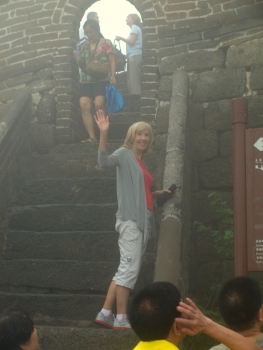 … we finally stepped, out of breath but thrilled, onto the Great Wall of China. Now the rain turned into a steady downpour, with our small umbrellas becoming ever less effective. 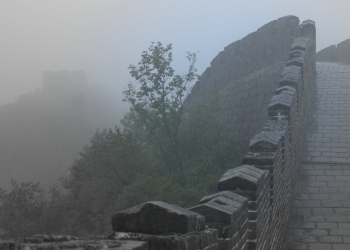 While not entirely treacherous in the rain, the walking path on the wall rises and falls sharply; the steps are uneven with tiny tops, huge risers, and no hand rails in the most problematic sections. We hiked to the first watchtower. 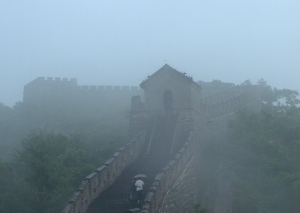 A cloud settled over the hill, so we could see only a short section of the Wall at a time. I thought it was going to be a disaster for pictures, but, with the Wall going on and on into the cloud, some of them turned out to be quite atmospheric. The rain fell harder, but we hiked on the to next watch tower. 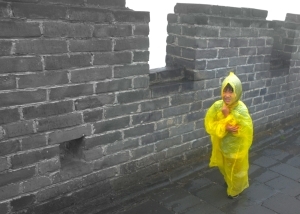 The wall was strangely quiet in the rain—few tourists. By now, my shirt was wet More rain, more refuge in the maze of mall rooms in watchtowers, more steps with 12-inch rises, more wet clothes. By the fifth or sixth watchtower, we were pretty well soaked, but not miserable because the rain was not cold, and standing where centuries of ancient warriors had defended the empire was enthralling. Although we wanted to walk the mile to the end of this section, the rain cloud kept us from seeing any of the surrounding countryside, and after about 45 minutes, we turned back. Most other visitors had done so as well; very few people remained on the Wall as we headed to the cable car for the trip down. It was disappointment in the sense that we couldn’t see the whole, long, magnificent wall wind its way into the far horizon, nor could we see the forest that stretches toward the distant and once hostile plains. On the other hand, most tourists had stayed away, and pictures of the Wall with no people are quite unusual. We ran the gauntlet of hawkers on the way down, jumped into the car, and drove a little way down the mountain to a restaurant where, some time ago, a collection of heads of state ate dinner. We thought that might mean over-priced and under-valued, but our roast fish (butterflied rainbow trout with a spicy dry rub roasted in an oven hot enough to crisp the skin), celery with lily, green beans with minced beef, and squash with lily was delightful and reasonable. We said that this was a California Chinese dinner – a little meat and a lot of vegetables; Sam said that Chinese people typically do not eat much meat at a meal. Since it was still fairly early in the afternoon, Nancy asked Sam about a representative “Beijing” souvenir – I guess the hawkers had gotten her thinking. We’d already gotten silk in Shanghai, so off we went to the cloisonné factory. We stopped at a government-owned factory, a dozen and a half small rooms built around an antiquated central courtyard. It looked like it had been built in the early 20th century and had not seen any refurbishment since then. We watched artisans of each of the major cloisonné construction steps (except for the final glazing steps which we were told is secret), Wired, painted designs undergo weeks of preparation, layer after layer, before the objects are lowered into gas-flamed pits to be fired seven times. Before the 1970s, the pits held coal fires. We learned that all these craftsmen are now subsidized by the government to keep cloisonné making alive. The work is tedious and only a few people older people still know and practice the art. We ended at the showroom, of course, and saw a mixture of antique and new pieces—large and small. 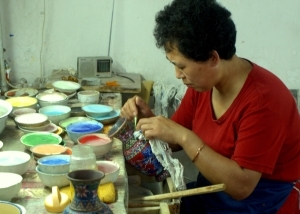 It took a while to find our treasure, but we finally managed to provide some support to the Chinese artisan economy. Fabulous blog! Thanks for the tour! Hi Mike – first of all your treats of “WordsAcrossTheWorld” are something that I really look forward to reading. This China experience that you had was utterly fascinating to read. Second, we miss you. It is almost like a dream that we met you. We get our “fix” when Nancy returns for a much too brief a visit. Wish she would bring you next time. Digby is most anxious to talk about your experiences and hear about some new wines. He just returned after a month in Australia visiting family. His trip was tiring, but interesting. His non-planned venture to Tasmania was a bonus. He had given some thought about coming to Singapore when he was down there, but that would have been while Nancy was over here and you, we guessed, would be in every part of the world except Singapore. Thanks again for your electronic sharing of your experiences. I almost feel like I am with you the way you describe your meals, or walks, or thoughts. Please come back and check us out. We lead pretty boring lives compared to yours. You are seeing the world and making money at the same time. Can’t beat that!